South Australia boasts some of the country’s best golf courses, festivals & events, world famous wine regions, restaurants, bars and beaches. South Australia Self Drive golf packages are one of the best ways to experience the region. Adelaide is a vibrant city full of exceptional food, wine, art and shopping. Adelaide loves to party – especially during Mad March which is when the city is at its most festive and the days are long and nights balmy. From the east end to the west the city plays host to a smorgasbord of world-famous musical and sporting acts when Adelaide Fringe, Adelaide Festival, Clipsal 500 Adelaide and WOMAdelaide drive the city into party mode There’s always something happening in Adelaide. The Links Lady Bay course is a St Andrews-style, sand-based course which is rated the leading country golf course in South Australia. Other local favourites include Victor Harbor Golf Club, the oldest in the region, as well as the course at McCracken Country Club, also in Victor Harbor. It boasts five memorable par threes and a fine driving course. Set your own course with a little help G&T with one of our South Australia Self Drive golf packages ,exploring the outback to cruising the coast. To request a quote for your own bespoke and unique tour to Adelaide or anywhere in South Australia, please complete the form below. We will be back in contact as soon as we receive your submission. Start packing your bags! Adelaide Hills – Just 20 minutes away from the city, the Adelaide Hills offers excellent golfing at Mount Osmond and Mount Lofty. Mount Osmond Golf Club has stunning views of Adelaide, the Mount Lofty Ranges and our coastline. The Mount Lofty Golf Club is nestled in the beautiful, tree-lined Piccadilly Valley. Blackwood Golf Club is open to visitors, except on Saturdays. The picturesque, gently sloping course is the ideal spot for a relaxed game. Mt Barker-Hahndorf Golf Club boasts 18 holes, par 70 rating. Old gum trees line the course, while the strategically placed ponds and creeks provide an interesting challenge. Adelaide’s coastline – You’ll find prestigious golf courses such as Royal Adelaide, Kooyonga, Grange and Glenelg dotted along Adelaide’s nearby coastline. All are featured in Australia’s Top 100 Golf Courses. The Royal Adelaide Golf Club at Seaton is one of six Australian golf courses ranked inside the World’s Top 100. Nearby, Kooyonga Golf Club is a championship golf course. It has hosted international and interstate championships and is located at Lockleys, just 20 minutes from Adelaide’s city centre. South of Adelaide – Links Lady Bay at Normanville is the number-one rated public course in South Australia and is in Australia’s Top 100 Golf Courses. The occasional kangaroo will join you on your round of this sand-based links course, which features a hotel, clubhouse and brilliant views. It’s just under an hour and a half’s drive from Adelaide and is en-route to the ferries at Cape Jervis that travel to Kangaroo Island. Nearby, Encounter Bay on the Fleurieu Peninsula provides a spectacular backdrop for the region’s oldest course: the Victor Harbor Golf Course. It offers an 18-hole, par 72 championship course. McCracken Golf Course also offers an 18-hole championship course. You can stay the night or more at the adjoined McCracken Country Club and take advantage of the luxurious facilities, including a lap pool, day spa and gym. Golf in the wine regions – There are courses in the famous wine regions of Barossa, Clare Valley and Coonawarra. And you’ll likely see a kangaroo or koala eyeing off your shot. Located in the heart of the Barossa, Tanunda Pines is set among 100 year-old gums and rows of leafy grape vines. 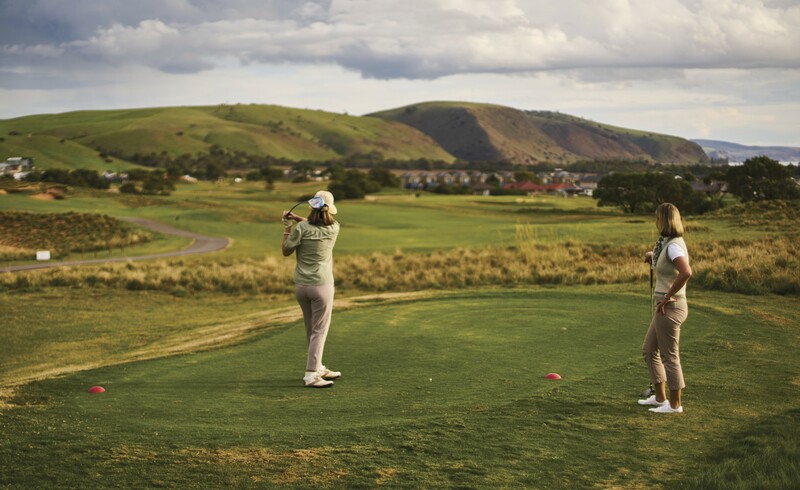 Brimming with wildlife and rugged natural beauty, it was judged as one of the world’s top golf courses by US Golf Magazine and is adjacent to the award-winning Novotel Barossa resort. Tanunda Pines offers a package called Down the Fairway and into the Cellar in conjunction with Novotel Barossa. It includes two rounds of golf, two nights accommodation, two lunches and two dinners complete with hosted wine tasting. They have a package called “Down the Fairway and into the Cellar” that involves 2 rounds of golf, 2 nights accommodation, 2 lunches, 2 dinners and hosted wine tasting, but they can also do packages that tie in to Novotel and Endota Spa which is in the Novotel as well. Yorke Peninsula – At the top of Yorke Peninsula’s ‘foot’, between Hardwicke Bay and Port Turton, the Flaherty’s Beach Sandbar Classic is a great family day out. For the best, it has to be The Dunes at Port Hughes on the Yorke Peninsula. Designed by golfing legend Greg Norman, this Scottish-style links course is PGA standard. The first nine holes are open and ready to play. The outback and beyond – The greens don’t get much rockier than on the par 72, 18-hole course in Coober Pedy. Tee-off on artificial grass surrounded by massive amounts of sand. This is the world’s only club with reciprocal rights with St Andrews in Scotland. The greens are grassless in Ceduna in far western South Australia. The flies though are very friendly and it does get windy, but if you bring lots of tees there are 18 holes to enjoy. For a real adventure, the Nullarbor Links is the world’s longest golf course spanning 1,365 kilometres, from Kalgoorlie in Western Australia to Ceduna in South Australia. It’s a quintessential Australian experience for travellers on the expansive Nullarbor Plain. Wherever you travel in South Australia, and if you having ‘driving ambition’, there are plenty of golf courses to choose from. Wow…..what a fantastic holiday! Well organised, lovely company, golf courses, accommodation and choice of restaurants. Book me in for next year NOW please!